Image 1 of 8. Click to view fullscreen. A bright and airy apartment, with automatic air-conditioning, it is south-facing, overlooking the swimming pool, children's pool and landscaped gardens. The large main lounge/diner area has a 2-seater and 3-seater sofa (sofa bed). Two patio doors lead to a terrace with table and chairs. Stairs lead to large roof sun terrace with loungers. 200m from the famous 5 star Villa Sol Hotel and the Villa Sol Golf Clubhouse. 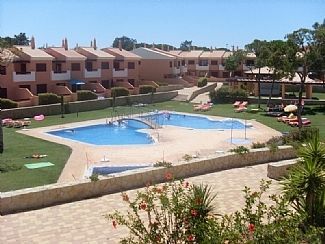 5 mins drive to Quarteira resort and beach and 5 mins drive to Vilamoura marina and beach. 3 mins drive to a water park and 5 mins to go-karting in Almancil. I live in Northern Ireland with my husband and 2 of our 4 children. My husband and I both work but love to holiday in Portugal. My husband is a keen golfer and the whole family enjoys the sun, the good food and reasonably priced wine as well as the relaxed way of life on the Algarve. We love the Vilamoura and Vila Sol area because of the climate and the beaches as well as the many other facilities which are always improving. My husband has 27 holes of good quality golf within easy walking distance and many other courses are close at hand including Quinta do Lago and Vale de Lobo. The local marina is a lovely spot for eating and relaxing and other good quality restaurants are within walking distance of our apartment. The balcony and sun roof of the apartment over look the swimming pool. The local supermarket is within walking distance with a bank and a number of shops and restaurants as well as an English style pub called Oscars in the vicinity. Main bathroom with jacuzzi bath and shower overhead, wc, bidet and sink. En-suite bathroom in bedroom 2 with shower, wc and sink. Living/dining room with dining table and 6 chairs, 2 sofas, fireplace, air-conditioning, cable TV, DVD player and CD/cassette player. Bright and airy living area with 2 patio doors leading to terrace overlooking the swimming pool area. Bright and airy kitchen with table and chairs. Fully fitted with oven, hob, microwave, fridge/freezer, dishwasher, kettle and toaster. The apartment is set within the exceptional 27-hole Vila Sol golf course. This Championship course has twice hosted the Portuguese Open. It is renowned as one of the best in the Algarve, designed by established architect Donald Steel. It has a fabulous club house including the Green Olive 5 star restaurant. The golf course is of a natural design and follows the wide valley and is split into 3 loops with 3 levels of difficulty including Prime, Challenge and Prestige. Golf buggies are available at the club house. Other local courses are all within a 15 min drive. There are many other golf courses in the area including Vale de Lobo and Quinta do Lago. Notes on accommodation: Air-conditioning can provide hot and cold conditions as appropriate. Electronic shutters are on living room patio doors and both bedrooms. An initial supply of drinking water and toilet rolls will normally be provided although the local water is drinkable. The two bedrooms have a large double bed and twin singles but there is a large sofa in the main lounge which can be easily converted into a large double bed allowing comfortable sleeping accomodation for 6 people. Outside: Both terraces overlook the swimming pool and landscaped gardens. There are sun loungers also available at the pool area. Cars can park outside the apartment on the road, however, there is an underground car park underneath the apartments, with designated spaces. Utility Room: Washing machine, drying area, iron and ironing board. Gas boiler for the water. Cleaning / Towels / Linen / Maid service: The apartment is cleaned before arrival and weekly. Towels and bedding will be changed on a weekly basis. A midweek service can be arranged at an additional cost. Other: The hall has a built-in wardrobe opposite the main bathroom. The large terrace has a table with 6 chairs, parasol and a portable BBQ. This leads up stairs to an enormous roof sun terrace with 4 reclining sun loungers. Great place, good location and a good example of the rentals available here! With our family having stayed at the same complex a number of times previously, I can safely say this is a great example of the properties available. It was in good conditions with plenty of amenities that were in great condition. The owner was very helpful and accommodating and we can thoroughly recommend it to anyone considering this area. Had a lovely holiday in this property, it has every amenity you could ask for, the large terrace is a great place to spend the day. A larger parasol would be a good addition. A larger parasol will be considered for the future. A previous large parasol was replaced after fair wear and tear by the current smaller one with a view to ease of movement. Had a great time. Extremly nice surroundings and the apartment had everything we needed. The owner was nice and friendly to comunicate with. We will be coming back. Aside from one small glitch around our arrival date (resolved within the hour) we simply could not fault this property. So much room, air con, well equipped kitchen...amazing balcony and roof terrace space...perfect! The pool area was clean and spacious - half the time we had it almost to ourselves - we especially loved being able to swim up til 11pm when it was dark and the area beautifully lit. There is a small supermarket about 10 mins walk away - note that if it’s as hot as it was when we visited it’s a bit of an effort but you can easily get an Uber to Pingo Doce, a bigger one just a few mins drive away. Vilamoura marina is also a quick Uber away, and a lovely place to stroll along in the evening. We had a fantastic time, there were some kids for our 11 year old to play with and if your idea of hell is a noisy, crammed, touristy resort then this is the place for you! We’d go back in a heaetbeat! Beautiful apartment in a lovely location with plenty of on site amenities. Such a spacious property with all the facilites you could need. Richard was so helpful in arranging our stay. The location is perfect. Short walk to vila sol and short taxi ride to vilamoura marina. Apartments are in a safe well looked after area. I would definitely come back to the apartment in future. Spent two weeks here in July 2017 - apartment is a great size and well decorated. Lots of space and really relaxing. Pool is just busy enough to keep kids occupied and the golf club is good for the driving range. Would definitely recommend this apartment and we will be returning. This renter took a few days out from their stay at the apartment and took the train to Lisbon for a mini-break. They seem to have enjoyed themselves there as well and have put the idea into my head. It is gratifying to have renters who wish to return for another visit and enjoyed their holiday. Vila Sol has its own private beach and is just a 15 min drive away. It offers beach restaurants, water sports, children’s activities and a crèche facility. Vilamoura beach is only a 5 min drive away. The gentle sloping beach of Quarteira is less than 5 mins drive away and is excellent for young families. Faro airport is only a 15 min drive away. Car hire is recommended but taxi hire is readily available and inexpensive. Leaving Faro follow the signs for Portimao and Albufeira until you get to Almancil and then head for Quarteira and Vilamoura. Turn right at the Vila Sol roundabout after the Aquapark. Public transport is frequent and also inexpensive. Both Easyjet and Aer Lingus provide daily flights to Faro from Belfast International but many other UK airports also offer regular flights to Faro. Vilamoura with it’s marina, shops, restaurants and bars is approx 5 mins by car, as is Quarteira. Almancil is less than 10 mins by car. The market town of Loule is just 10 mins drive. A large aquapark is 3 mins away by car and Albufeira and the Zoo Marine is approx 20 mins away. The Vila Sol Spa is a 2 min walk from the apartment. At the entrance to Vila Sol resort there is a retail village including an ATM, an English pub serving food, restaurants, coffee shop and other shops. Quarteira is a 15 minute walk away with lots of shops and at least one chemist. Whilst no phone is available in the apartment, internet access is available through a Sunset Villas local wireless network which will cope with email and basic requirements. Booking Notes: Prices are for the property per week in UK pounds. 25% of the cost is payable on booking with the balance due 2 months before departure. The booking deposit will normally be non-refundable. Changeover Day: Our preferred changeover day is Saturday, however, we will be flexible. Notes on prices: Prices are for the property per week in UK pounds. Euros can be accepted subject to an agreed rate of exchange at the time of booking. 25% of the cost is payable on booking with the balance due 2 months before departure. Special monthly winter lets may be available at special rates, please enquire for availability and price. Also please enquire for daily rates or extra days.